I was in tremendous pain the day of my first visit. The staff was so accommodating to my difficulties walking andmy doctor took the pain I was in very seriously...he did not treat me as though he did not believe me. I was in tremendous pain the day of my first visit. The staff was so accommodating to my difficulties walking and my doctor took the pain I was in very seriously...hedid not treat me as though he did not believe me. This doctor seems to be very new to practicing medicine. Also, he felt that treating pain with medication was some unheardof practice. Didn't have any connections to neurologists. This doctor seems to be very new to practicing medicine. Also, he felt that treating pain with medication was some unheard of practice. Didn't have any connections to neurologists. Please note that medications will not be prescribed at initial consult visits. Dr. Bhatia is a Harvard fellowship trained pain management physician and board certified Anesthesiologist. He specializes in treating patients with spine related back and neck pain disorders, and has extensive training in treating patients with chronic pain conditions. His area of expertise encompasses RSD/CRPS, cancer-related pain, fibromyalgia, arthritis related pain, and sports related injuries. He is proficient in performing several advanced surgical and interventional techniques including epidural injections, imaged guided joint injections, radiofrequency ablation treatments, spinal cord stimulator, sympathetic nerve blocks and vertebroplasty. 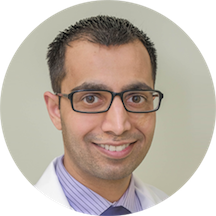 Dr. Bhatia also serves as chair of the pain committee at UVA Culpeper hospital and is a valued consultant for both acute and chronic pain service. His clinical research has been published in leading medical journals such as JAMA, ACOG, and Hindawi. He has also authored chapters in several pain medicine textbooks. He has been a member of the International Society of Interventional Pain, American Society of Regional Anesthesia and Pain Medicine, and American Society of Anesthesiologists. Dr. Bhatia firmly believes that chronic pain affects patients in more ways than just physical discomfort. It affects a person's mood, their lifestyle, and puts a strain on their psychosocial and socioeconomic quality of life. Therefore, it is imperative that treatment is initiated early on in a thoughtful, meticulous and efficient manner to minimize the impact on an individual's lifestyle. As a physician, it is very gratifying and satisfying for him to help patients at the time of an acute need, and to see a patient improve and get back to his/her activities. My visit with Gaurav was great. I appreciate his advice about my low back pain. Dr. Bhatia is most professional. I found him to be most knowledgeable and current in his findings and treatments. He is also a very easy person with whom to speak and is also quite sociable. It was good for me tofind a new Dr. after just moving to this area. Overall it was a great visit. Listened to my concerns and came up with a possible solution I haven't tried before. I was able to get that scheduled within a week and will find out soon how that goes. I would recommend Dr. Bhatia. Very informative and helpful. Great office staff.